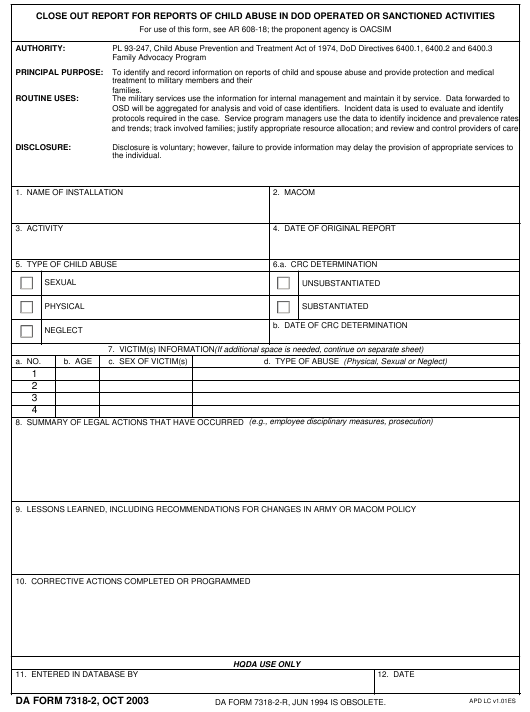 DA Form 7318-2 - also known as the "Close Out Report For Reports Of Child Abuse In Dod Operated Or Sanctioned Activities" - is a Military form issued and used by the United States Department of the Army. The form - often mistakenly referred to as the DD form 7318-2 - was last revised on October 1, 2003. Download an up-to-date fillable PDF version of the DA 7318-2 below or request a copy through the chain of command. and trends; track involved families; justify appropriate resource allocation; and review and control providers of care. DA FORM 7318-2-R, JUN 1994 IS OBSOLETE.